There are a lot of sites on the web that I like to read. Some are updated hourly, some daily, and some monthly--or even less frequently. Keeping up with all that content is practically impossible if you tap the URL in to your browser's address bar, and very difficult if you keep bookmarks of everything. How do I keep up? A lot of sites provide RSS feeds (typically signified by the orange-and-white icon: ), along with a Google account for Reader make it really easy to read it all! First, you'll need an RSS feed reader. A feed reader will basically let you collect all the feeds you like and--most importantly--display new items when the feed is updated. 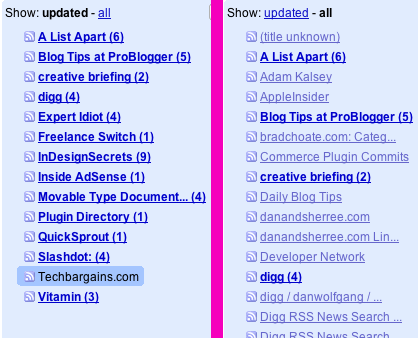 Highlighting the new content and letting you organize and read it easily is where that "ah-ha!" moment will really take place. It's easy to read any of your subscriptions today--when they're new--or save them for tomorrow, next week or even next month. You can read on your schedule, the feed reader just keeps track of what's new. I like Google Reader (yes, free! ), but there are many others available that are both web- and desktop-based. The screenshot at the right shows my RSS subscriptions through Google Reader. 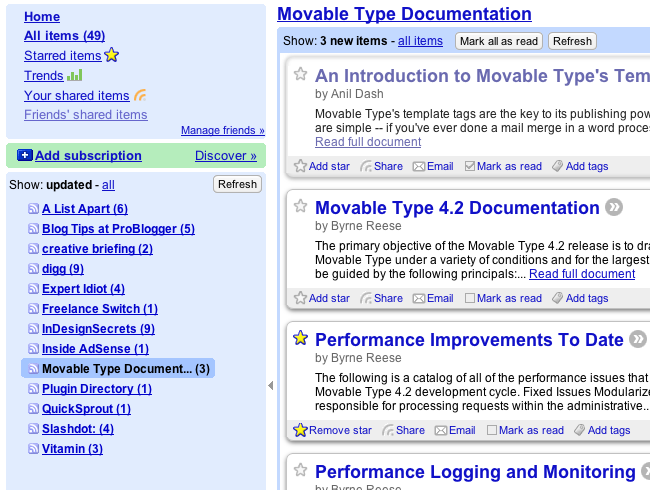 On the left is the normal "updated" view, showing the web sites with content I haven't read yet. On the right is the "all" view showing all of the feeds I'm subscribed to. 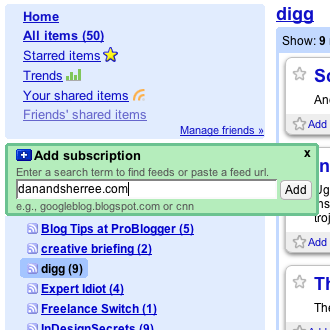 After signing up for Google Reader you'll want to subscribe to some feeds. An easy way to do this is with the "Add Subscription" link on the left-hand side--just click it and paste or type in the URL of a site you want to stay up-to-date with (for example: "danandsherree.com"). If a feed exists and the site has fully integrated the feed with the site, the "Add Subscription" link will find the feed and add it for you. Go ahead and add a bunch of feeds. With a bunch of feeds in there, you'll want to read them. You can just click a feed and scroll through to read the items. As you scroll, it's marked "read." "Read" items won't show up in Reader anymore--meaning you'll only be shown the newest content you haven't read. If you don't want to mark it as read, hit the checkbox, or if you really like it, Star it. It's easy to zip through sites like this, and pay attention to the stuff that really interests you--in other words, it's easy to ignore a story if you're not interested in it--who reads everything anyway? In the screenshot at the right you can see that I've marked an item as "read" and Starred another. To see everything I've starred, I can look in Starred Items near the top-left. There's so much more to Google Reader than I've written about it, and a good deal of it that I've not explored myself, even. This is certainly enough to get started, though--and now you can keep up with all the sites that interest you! Thank you. I was wondering about RSS feeds, but didn't know where to begin, or even if I wanted to! :-p I might actually look into it now as my volume of suggested readings is expanding. thanx!! i didn't know how these things worked!! Previous: What Type of Romantic Food Are You?